Have you ever been eating an ice cream cone in San Diego when you felt a sudden jolt of pain in one of your teeth? If the enamel is eroded, or the gums have receded, the dentin layer of the tooth is exposed. 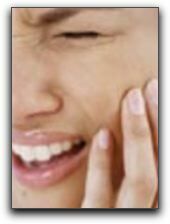 The substances that cause tooth pain travel to the pulp where the nerves of the tooth are located. Ouch! Tooth sensitivity can be a signal that something is wrong. It may be caused by periodontal disease or bacteria build-up in a crack in a tooth. Enamel erosion can be caused by a number of factors including acidic foods and drinks, teeth grinding, or cracked teeth. If your teeth are sensitive following a professional teeth whitening such as the ones we do here at Marcos Ortega DDS, the sensitivity will probably be gone in a few weeks. Surprisingly, one cause of gum recession for our San Diego patients is brushing too hard. That’s right; it is possible to brush too hard! If you experience constant or intermittent pain in your teeth or gums, call 619-295-4545 right away to make an appointment. Dr. Marcos Ortega takes tooth pain seriously. At Marcos Ortega DDS in San Diego, we not only treat tooth sensitivity problems, we also perform entire smile makeovers for cosmetic dentistry patients in the Hillcrest and Mission Hills, Mission Valley areas. You’ll find us in the 92103 zip code area.